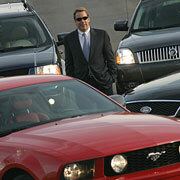 Bill Ford with some of the company's 2005 models. About William Clay Ford Jr.
Family: Wife, Lisa, and four children. The oldest is a Princeton University freshman, the youngest is 9. Education: Graduated from Princeton in 1979, earned an MBA from MIT in 1984. Career: Joined Ford Motor in 1979 in product planning. Named to board of directors in 1988; chairman, Jan. 1, 1999; CEO, Oct. 30, 2001. Lineage: The son of William Clay Ford, a board member, and nephew of the late Henry Ford II, Ford Motor president in the 1970s. Henry II and William are sons of Edsel Ford, the son of company founder Henry Ford. His mother is Martha Parke Firestone, a granddaughter of Firestone Tire founder Harvey Firestone. Family rivals: None. Cousin Edsel B. Ford II, once considered a possible CEO candidate, is former COO of Ford Credit, a board member and owns Pentastar Aviation. Second cousin Elena Ford, granddaughter of Henry II and daughter of etiquette expert Charlotte Ford, is director of North America product marketing for Ford Motor. Second cousin Al Uzielli is a senior adviser to the company, working in Ford's Los Angeles-based Global Brand Entertainment office to get Ford cars starring roles in movies. First car: A shocking green Mustang, a high school graduation present. The paint, meant for indoor auto shows, peeled off in the Michigan winter. Hobbies: A black belt in tae kwon do. He plays hockey on a local intramural team. DETROIT — Bill Ford likely won't read this story. The CEO of Ford Motor (F) has seen what happens to leaders who read stories about how great they are. "I don't ever want to believe my own press clippings, good or bad," Ford said on a recent afternoon. "One of the things I've had the advantage of, growing up and being close to the top management of this company and other companies for most of my life, is seeing how CEOs start to believe in their own infallibility. And that really scares me." It would serve Ford, 47, well not to read this story, then, because it's hard to get anyone to say a negative word about him. To hear people talk, Ford's rise to power at the carmaker his great-grandfather founded is on par with King Arthur's sword-pulling feat. Some say there was only one man who could have turned around Ford Motor when Bill Ford took over as CEO in 2001. He knew who he was. He suspected he had a responsibility to the company since he was a young boy, driving down local roads seeing his last name plastered on hospitals, museums and libraries. He daydreamed about doing something else, maybe something environmental. But when the time came, he stepped up. Even though he had hoped the time wouldn't come until later, when his kids were in college, if ever. "The company as well as the dealers had basically shut down. Management had just lost them," said David Cole, director of the Center for Automotive Research. "It was as difficult a situation as we've seen. And actually Bill Ford was almost uniquely the person who had to come in and lead the company. "It was well ahead of his personal plan, but Bill was ready to go over the falls." In the months after William Clay Ford Jr., great-grandson of Henry Ford, took over as CEO in October 2001, few outside the second-largest automaker believed he could succeed. Ford had been chairman of Ford Motor since 1999 and had shared control of the company with then-CEO Jacques Nasser since July 2001. But he was seen as too young, idealistic and inexperienced to handle both jobs. When Ford took the CEO job after the board ousted Nasser, the company had just posted a $692 million loss for the third quarter, a stunning plunge from $994 million in profit a year earlier. Battered by costs of the Firestone tire recall — most of the tires were on Ford Explorer SUVs — Ford Motor lost $5.5 billion in 2001. "We took our eye off the ball as a company," Ford said in an interview late last year with USA TODAY. "When we're in a peak, we make a ton of money, and as soon as we make a ton of money, we're desperately looking for a way to spend it. And we diversify into areas that, frankly, we don't know how to run very well. And it distracts our management. And then we kind of go through a trough: 'Um, better get back to basics.' And then we go through this cycle again." By January 2002, the new CEO had pulled together a turnaround plan that called for cutting 12,000 hourly and 5,000 salaried jobs, closing five plants, trimming material costs, discontinuing low-profit models, and shedding non-automotive businesses. Wall Street was skeptical at first, but the carmaker has beaten analyst expectations 12 out of 13 quarters since Bill Ford became CEO. Eventually, analysts began grumbling because Ford's earnings were consistently so much better than their projections. Inside the company three years after Bill Ford took over, many workers sound inspired and energetic. True believers call him a visionary, saying his commitment to making cleaner, more efficient cars will leave a legacy in the industry. They point to the gas-electric hybrid version of the Escape SUV as one success and predict they'll be the first to offer mass-market hydrogen cars. Ford is seen as more coach than boss, encouraging those who disagree to speak up. Soon after his ascension, the company abandoned its system of giving letter grades of A, B or C for employee performance. Workers say the grading system — which required each manager to give a certain number of Cs — created a culture of fear and intense competition. Ford's new evaluation system emphasizes teamwork. "I walked in and inherited a management group that I didn't know very well. They didn't know me, and we had a very short window to put together a credible recovery plan." "When I look back now, it was a remarkably good plan. And God knows how that happened. But, it was. And we've exceeded (Wall Street earnings) estimates every quarter, which in some cases is not very heroic, because people didn't expect a whole lot." And it doesn't hurt that the CEO's last name is Ford. "Think about what it means to have the founder's great-grandson running the company now," says Mary Ann Wright, director of Ford's hybrid vehicle programs. "He's in it for the long term. And he calls us family." Despite a privileged upbringing in tony Grosse Pointe, Mich., and education at a Connecticut boarding school and Princeton University, Ford can come off more as the guy next door than as a captain of industry. Dan Murray never expected to be friends with the chairman of a Fortune 500 company. Then a freelance photographer for the automaker and martial arts instructor, he wasn't quite sure what to expect when Bill Ford sat down next to him on a company plane seven years ago. Before he knew it, Murray agreed to help Ford get in shape for his black belt. "The first time out, I broke his nose," Murray said. "He called me later to tell me he had a great time." They worked together for nearly three years, Murray pushing Ford's buttons to drive him to improve. "The worst thing you can do is tell Bill he can't do something," said Murray, now with Ford's public affairs department. "He just comes back and works twice as hard to prove you wrong." Ford continues working to prove wrong the outsiders who have been telling him he won't make his financial targets. Ford Motor reported net income of $3.5 billion last year, up from $495 million in '03. But its core business — making and selling cars and trucks — has been a money-loser bailed out by Ford Credit. It's improving. Ford said that when he took over, "Six of our eight auto operations were losing money. Today, the only dog we have financially is Jaguar. And we've got to fix it. I'm spending more and more time in the last six months with Jaguar because the rest of our brands are doing very well financially." Besides the Ford, Mercury and Lincoln brands, Ford Motor owns Jaguar, Land Rover, Volvo, Aston Martin and 33.4% of Mazda. Still, incentives and other marketing costs remain high. Costs of basic materials such as steel are increasing. And health care expenses are growing fast. Ford says his first goal as CEO was to "re-establish the credibility of the brand. And I didn't think you could do that while you were basically giving vehicles away to rental car companies." That floods the market and drives down the values of cars and trucks. But cutting rental fleet sales "takes a leap of faith," Ford said, because sales and market share tumble before profit from the new strategy shows up. "So you kind of hold your collective breath and think, 'Oh my God! Is this working?' And it has worked." Maybe so. Depreciation expert Automotive Lease Guide says that a midlevel Ford Five Hundred sedan bought today should be worth 47% of its sticker price three years from now — up from 28% for a midlevel Taurus, which Five Hundred replaces. But ALG President Raj Sundaram cautions: "It is one thing to say you're going to do less fleet, another to do it." And he notes that Five Hundred's residual value remains less than that of its Japanese rivals, Toyota Camry at 49% in three years, Honda Accord at 53%. Ford's other battles are image-related: that it is not concerned enough about the environment and that its cars and trucks are unexciting. Critics note that Ford has the lowest average fuel economy of any full-line automaker. Late last year, environmental groups staged a protest against Ford. Bill Ford dismisses the criticism. "I think the world is filled with so much hype and PR bull. Frankly, it all comes out in the end. Good or bad, I'd rather just let our accomplishments really speak for themselves." Sierra Club director Carl Pope recognizes that Ford has a difficult balancing act. "The dilemma is he's got less time to lead now than he ever did. He's got Toyota breathing down his neck, and I think there's a shift in consumer expectations" for fuel-efficient cars. Ford has said that a key part of the company's turnaround is making sure it is producing products that people want to buy. The redesigned Ford F-150 pickup posted record sales last year, and the new Mustang is off to a solid start. But design tweaks already are planned for the Five Hundred to satisfy those who think the car is boring. And if the winners don't outnumber the losers, Ford doesn't expect his name will save him. "Nobody's irreplaceable, including me. I think for too long we've had a cult of personality in this company and in this industry, and frankly, I'd like to see that diminish."